HeavenSent Bulldog Rescue - Bulldog Breed General Information. Maggie lives the high life. Before beginning the process of adopting a bulldog, consider whether or not an English Bulldog is the right dog for your family and your lifestyle. Bulldog ownership requires daily commitment to meet particular needs, unlike other breeds. They are "people" oriented dogs who thrive in a loving and nurturing environment where they will be thought of as a real member of their family. 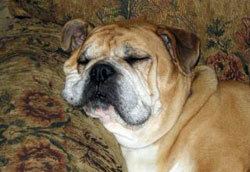 Bulldogs can be prone to numerous health issues. Common conditions may include an elongated soft palate, a small trachea, allergies, various skin issues, eye lid abnormalities, cherry eye ,hip dysplasia, and orthopedic problems. If you are adopting an older bully many of these conditions will already have been identified. Bulldogs are extremely intolerant of the heat. They must be kept in an air conditioned area when the outside temperature is over 70 degrees, with very limited outdoor activity. They are not usually capable of prolonged physical activity whether the temperature is hot or cold. Bulldogs are not for someone who enjoys taking a dog for long brisk walks. They also have problems swimming because of their body shape and density, and can sink and drown if left unattended near a pool. Although many Bulldogs enjoy sunbathing, few are wise enough to realize they have reached or exceeded their level of heat tolerance. A Bulldog's body temperature can rise to a critical point in the absence of ANY physical activity. Without emergency intervention, death due to heat exposure could be imminent. This risk obviously applies also to dogs who are left in a car during ANY season. Bulldogs tend to have breathing problems as their flat face restricts air and interferes with the body's ability to cool itself. Because of this they must be closely monitored in hot weather as they can suffer heat stroke more easily than breeds with long noses. In addition, many bulldogs also suffer breathing difficulties as a result of an elongated palate which can all too easily obstruct their airway. The elongated palate can be surgically correected, but if left untreated, it can yield trademark breathing and snoring difficulties characteristic of the breed. Excessive panting in a Bulldog can lead to the irreversible "collapse" of the larynx. Because of the large heads in proportion to body size, baby bulldogs are usually delivered by cesarean section. Natural birth can result in the loss of the pups and can be too strenuous on the mother. Contrary to classic cartoon parodies and nicknames of the breed, such as 'Sour-Puss" that depicted a ferocious bulldog wearing a spiked dog collar, the bulldog is a gentle breed and gets along well with humans, including children, and usually with other dog breeds. The reputation of being ferocious was true during the days of bullbaiting, but the aggressive tendencies were bred out of them by the time of the second world war . Bulldogs are very friendly and playful, while also being stubborn and protective. A bulldog is great for houses as well as apartments, due to the little exercise they require, especially as adults. Nonetheless, puppies may be destructive until reaching maturity. The term "bulldog" was first used around 1500 and might have been applied to various ancestors of modern bulldog breeds. In the 1600s, bulldogs were used for bullbaiting , a wagering sport popular in the 17th century in which trained bulldogs leapt at a bull tethered to a post, latched onto its snout and attempted to suffocate it. The practice of bullbaiting was banned in England in 1835. After bullbaiting was banned, the breed began to die out (known as the Old English Bulldog) until fans turned to conformation dog shows. Just a few years later, in 1864 , a club was organized to enhance the breed.